Donations - Little Sisters of the Poor Kansas City - Support us today! Jeanne Jugan Center needs your help! As a mendicant order, (one which relies solely on the charity of others), we do not enjoy any type of endowment or long-term funding. 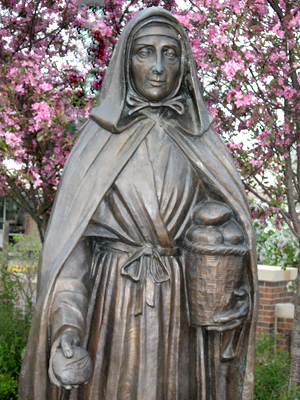 Following in St. Jeanne Jugan’s footsteps, we Little Sisters rely solely on God’s Providence through the generosity of our friends and benefactors to provide for the needs of our Residents. Every donation helps! Approximately 60% of the funds needed to operate our Home come from the Residents – most of this is Medicaid reimbursement for nursing care. The remaining 40% of the needed income is generated through fundraising – everything from direct mail campaigns, church collections, legacies and grants, to the numerous fund raising events held each year. We invite you to consider becoming part of the loving family of the Jeanne Jugan Center by helping the Little Sisters of the Poor through your prayers, generous gift of self or contributions. Tomorrow’s needs in caring for the elderly can be met by helping today! Retirement Plans and IRAs: A growing option, the Little Sisters of the Poor can be named as the entire or partial beneficiary of a donor’s retirement plan assets upon his or her death. Life Insurance Policies: A faithful supporter may gift an existing life insurance policy to the Little Sisters if the reason it was originally purchased no longer exists. A charitable deduction for roughly the policy’s cash surrender value can be taken, and the proceeds are completely removed from the donor’s estate . Matching Gift: Many workplaces will match contributions made by their employees or retirees. Please find out if your employer has a Matching Gift program. Tribute Funds: These gifts can be in memory of a deceased loved one, or to honor someone’s special occasion such as a birthday or anniversary. Gifts in Kind: Businesses and individuals can donate needed items such as food, personal care items and office supplies. See Wish List (pdf). Little Sisters of the Poor is a registered 501 (c)(3) public charity. Donations are tax deductible to the extent allowed by law. "Our benefactors: where would we be without them?"